Dogs are needy creatures. Most of the time, they want to be right next to their owners, no matter what's happening. Dog-loving yogis will enjoy this book that incorporates their furry friends into the mix. The book comes with full-color photographs and clear step-by-step directions. Help your mom add extra life to her backyard or garden with a bag of seed bombs. The handy sacks contain 10 walnut-sized bombs brimming with your choice of flower seed. To plant, the user just needs to toss them outside and watch them grow. Best of all, the new flowers will promote butterfly and bee populations. Help your mom mix up her produce with this kit that includes seeds to grow purple carrots, red Brussels sprouts, striped tomatoes, yellow zucchini, and multi-colored swiss chard. The set also features starter growing pots, plant markers, and gardening tips. Your mom will love seeing you and the rest of the gang illustrated on matching cupware. To get started, you just pick which pre-drawn figure looks the most like each family member and then add the name. You can also change up the shirts and hair so they can wear their favorite colors. Moms who are also big readers will enjoy a cup of this special tea alongside their favorite books. The tea bags are adorned with tags that feature literary quotes from authors all over the world. Each box comes with 25 bags containing English breakfast tea. This special mug isn’t like other mugs: When you add hot water, the night sky lights up with constellations from Hercules to Cassiopeia. Just warn mom that she'll need to hand wash this one; machine washing it will ruin the heat-sensitive material. If your mom is into animal-themed kitchenware and also loves a good cup of tea, then this sloth is the perfect gift. The adorable tea infuser sits languidly right on the edge of the cup until your tea is ready. A mom who loves cooking with precision will love this cutting board, which will help her get each and every ingredient exactly the right shape and size.The board comes with a series of lines to guide the cutter, including how to: medium dice, small dice, brunoise, fine brunoise, batonnet, allumette, julienne, and fine julienne. The lines are burnished instead of printed, so they'll never get worn away. Remind your mom of the days when she used to read to you at night with this special tote bag. Out of Print makes a number of different bag designs that resemble childhood classics like Where the Wild Things Are and Goodnight Moon. By purchasing the tote, the seller sends one book to a community in need. The KitchenAid standing mixer is a device beloved by bakers worldwide. If your mom spends a lot of time whipping up cookies and cupcakes, then this is the gift for her. The fancy kitchenware works with 15 optional attachments and comes in a variety of colors. We’re not saying your mom will bake you some thank you cookies if you get her this, but it could happen. These Prosecco-flavored gummy bears are the perfect sugary something for moms with a sweet tooth. They don’t contain any alcohol, though, so you’ll need to get a real bottle of the bubbly for that. This fancy necklace holder isn't something you can pick up just anywhere. It’s made with Manzanita branches that were taken from the high desert of southern California and coated with a gold paint finish. The carved tree offers miniature branches perfect for hanging jewelry and other knick-knacks. The beautiful tree sits on a hand-rubbed, alabaster base. If your mom is the creative type, consider giving her a piece of technology that makes being creative easy. This elegant stylus, made by FiftyThree, looks and feels just like a real pencil. It works perfectly with the matching app as well as other apps like Noteshelf and Sketchbook Mobile. Just like a real pencil, you can draw, blend, and erase. It’s Bluetooth smart and has a long lasting battery. After a hard day of taking care working or taking care of kids (or both), the mom in your life deserves something that will help her unwind. This back massager has a heating function and four rotating nodes that help soothe aching muscles. It even comes with a car charger for relaxing on the go. Show your mom how super you think she is with this novel bookshelf. The special “floating” appearance is actually created with a hidden surface that slips inside the bottom book’s sleeve. The superhero is magnetized and keeps the book closed while giving the illusion that she is holding the whole stack in the air. Moms who cook and have a sense of humor might like this Nessie ladle. Its adorable shape makes it look like the mythical Scottish creature is lurking in the evening's stew. The nylon ladle is machine washable but should not go in the microwave. Terrariums are a lot of fun to keep around the house and even more fun to create. Give your mom all the necessary fixings to make her own with this pre-assembled kit, which includes a teardrop-shaped enclosure, hemp twine, an air plant, purple quartz, white rocks, dried echinop, reindeer moss, and juniper sprigs. We are quick to wash our hands throughout the day, but less quick to clean off our phones, which come in contact with a lot of dirty things (specially if you drop your phone a lot or, ahem, take it to the bathroom). Germ-fearing moms will be grateful for this handy device that sanitizes a phone in a mere four minutes. Simply plug the phone in and close the lid and the UV light will zap away any germs. Most phones fit inside—even the iPhone 6 Plus. Mothers with a lot of devices on their hands will love having a place to stash all their things. This bamboo organizer comes with an interior storage area for chargers so the devices can all charge at the same time. This waterproof speaker works with Bluetooth and comes with a powerful suction cup that allows it to cling to flat surfaces. It plays for about six hours on a single charge and also takes calls. Besides blue, the speaker also comes in black, pink, camouflage, and leopard print. 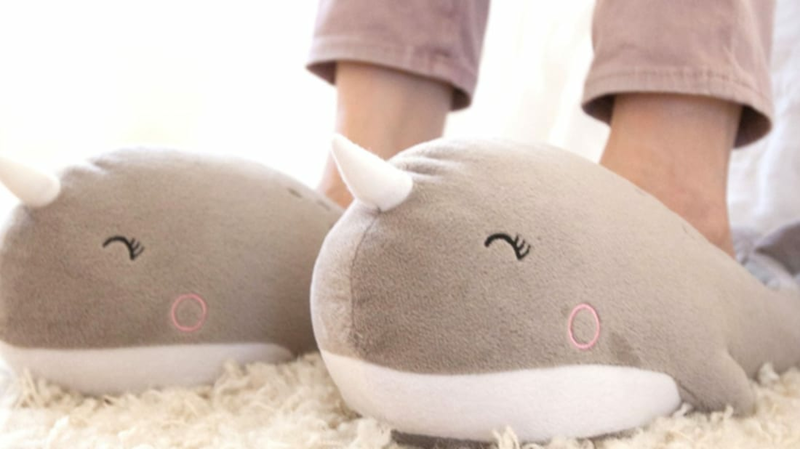 Relaxing is about to get a whole lot more adorable with these heated narwhal slippers. The happy looking footwear fit most feet and come with a USB-powered heating option. If your mom doesn't want to get tied down with wires, there's also a wireless option.